Render your precised respect and reverence to Christianity and show the world that you are a proud Christian with a wide and exclusive extent of Catholic religious items available at HolyLand-Gifts.com. All sorts of religious supplies we deal in can be availed in different styles, types, finishes, designs and patterns. Being custom and easy to wear, they satisfy your appetite for something different that you can put very close to your heart. Our wooden made cross pendant necklace for men with leather cords are a perfect fit for men of all sizes and types from all corners of the world. Our wooden or mother of pearl necklaces have some unique characteristics that all recipients will like to love. 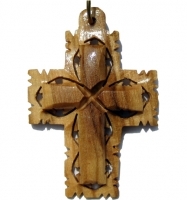 As you browse our wide and exhaustive selection of cross necklaces and cross pendants for men, you become able to get intricate carving work that is matchless. Once you get your choice cross pendants from our selection at your doorstep, you will be pleased with incredible handiwork from Bethlehem craftsmen who leave no stone unturned to impress you. Buying from holyland-gifts.com was the best thing I have ever done. The prices on their cross pendant necklace are undoubtably the best prices you will find world wide.